We help orphaned children ... those affected by HIV/AIDS, left alone in the gutters to face hunger and abuse, abduction into being a child soldier or prositute or even to die. Thanks to people like you who sponsor we can give then a chance in life, dignity and love. 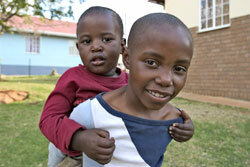 Support a child at one of our SOS Children’s Villages and join our SOS family.